TeamPaulC: Let the rumpus BEGIN! 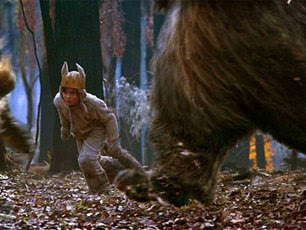 The "Where The Wild Things Are" movie is currently scheduled for an October 2009 release! YAY! Its based on the book (obviously) and will feature huge puppets with CGI faces. I am SO glad that they did not go 100% CGI. puppets, or muppets? And do you know the difference? Okay, technically the only difference is Frank Oz and Jim jr. make muppets and anybody can make a puppet. Examples: Yoda - Muppet. Team America - Puppets. I once wrote a paper on the practical differences between puppets and muppets, but now my brain is filled with hops residue and I'll probably never remember them. The articles that I read said people, inside of giant puppets. ?? I thought that what Team America used was marionettes? Big puppet suit with a person in it, but only to move the main body around. Details like facial expressions, hand movements, etc. are all controlled off-camera like a puppet. little known fact Dragon is an actual muppet. Its true. Lisa operates the controls.